In The First World War the players control the armies that battled for control of Europeâ€™s destiny. Deploying the forces on a game board of Europe from Constantinople to the English Channel, they must fight for control of key cities to gain victory in an age of Total War. August 1914: For two generations there has been no war between the Great Powers of Europe. Now, following the assassination of the Austrian Archduke Franz Ferdinand by Serb nationalists, the Central Powers (Germany and Austria-Hungary) are at war with the Allies (Russia, France and Britain). The cheering crowds in every nation expect their armies to return victorious â€œbefore the leaves fall.â€� But there will be no easy triumph, and as more nations are drawn into the conflict, the bloodletting will continue on a massive scale for four more years. Finally, on November 11, 1918, a defeated Germany will sign the Armistice, ending what we know today as the First World War. 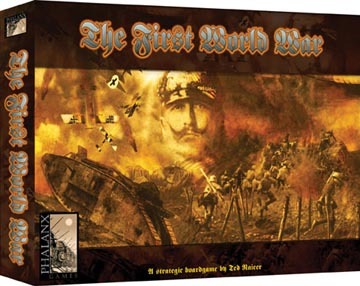 The First World War can be played by 2, 3 or 4 players. In a 2-player game, a player represents either the Central Powers or the Allies. In a 3-player game, one player takes the Allies, another Germany, and the third the German Allied nations of Austria-Hungary, and Bulgaria. In a 4-player game, one player takes the Western Allies, one takes the Eastern Allies, one takes Germany, and another the German Allied nations.